Colorful, easy to wear, and versatile designs top this season’s hottest jewelry developments. Fall 2016 is about big, bold and colorful cocktail rings! Reach for the sky in this Ivory Sky cocktail ring. 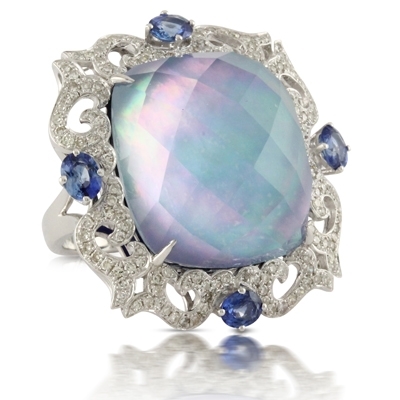 Lovely Lapis, white mother of pearl and white topaz combine for a vibrant grey-blue with rainbow hues. This ring is a true show stopper! Jewelry fashion trends are often born rom the creative minds of designers and featured on high fashion runways. These designs start out as extravagant , avant-garde statements meant to accentuate a collection of garments and overall concept of the designer’s line. From there, celebrities and stylists cherry pick and cultivate jewelry designs to wear n the red carpet, and those looks are shared to the masses. The Dove’s Viola cocktail ring above features the Pantone Color of the Year. 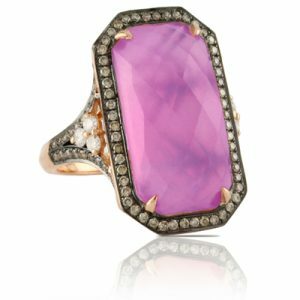 Rich Amethyst is coupled with pink mother of pearl resulting in an expressive, creative and embracing purple. Surrounded by diamonds, this is the ULTIMATE cocktail ring! This season, it’s all about colorful cocktail gemstone rings. The bigger, and bolder..the better! These dramatically styled rings are often seen in clusters of vibrantly colored gems or with large, colored center stones surrounded by diamond accents or smaller complementary colored gems. From Sapphires to Rubies, to even Turquoise stones, the options for this look are endless. Some people prefer a giant center stone showstopper look, while others prefer a smaller center stone surrounded by gemstones or diamonds. The design choices are vast and there is a style to accommodate any taste. 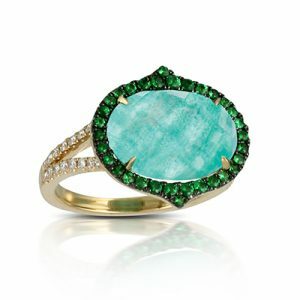 The center stone for this cocktail ring originated in the Amazon River, this “Hope Stone” is known to soothe the spirit and calm the soul. Faceted, clear white topaz is layered with amazonite and surrounded by diamonds to create a glamorous look. At the top of the list are the designs worn by royalty and celebrities. When copied and revamped, these fashion forward designs are readily available in a wide range of styles and prices to suite any age, budget or style!